One of the greatest mysteries of experimental physics is how so-called high-temperature superconducting materials work. Despite their name, high-temperature superconductors—materials that carry electrical current with no resistance—operate at chilly temperatures less than minus 135 degrees Celsius. They can be used to make superefficient power cables, medical MRIs, particle accelerators, and other devices. Cracking the mystery of how these materials actually work could lead to superconducting devices that operate at room temperatures—and could revolutionize electrical devices, including laptops and phones. In a new paper in the journal Nature Physics, researchers at Caltech have at last solved one piece of this enduring puzzle. They have confirmed that a transitional phase of matter called the pseudogap—one that occurs before these materials are cooled down to become superconducting—represents a distinct state of matter, with properties very different from those of the superconducting state itself. When matter transitions from one state, or phase, to another—say, water freezing into ice—there is a change in the ordering pattern of the materials' particles. Physicists previously had detected hints of some type of ordering of electrons inside the pseudogap state. But exactly how they were ordering—and whether that ordering constituted a new state of matter—was unclear until now. "A peculiar property of all these high-temperature superconductors is that just before they enter the superconducting state, they invariably first enter the pseudogap state, whose origins are equally if not more mysterious than the superconducting state itself," says David Hsieh, professor of physics at Caltech and principal investigator of the new research. "We have discovered that in the pseudogap state, electrons form a highly unusual pattern that breaks nearly all of the symmetries of space. This provides a very compelling clue to the actual origin of the pseudogap state and could lead to a new understanding of how high-temperature superconductors work." The phenomenon of superconductivity was first discovered in 1911. When certain materials are chilled to super-cold temperatures, as low as a few degrees above absolute zero (a few degrees Kelvin), they carry electrical current with no resistance, so that no heat or energy is lost. In contrast, our laptops are not made of superconducting materials and therefore experience electrical resistance and heat up. Chilling materials to such extremely low temperatures requires liquid helium. However, because liquid helium is rare and expensive, physicists have been searching for materials that can function as superconductors at ever-higher temperatures. The so-called high-temperature superconductors, discovered in 1986, are now known to operate at temperatures up to 138 Kelvin (minus 135 degrees Celsius) and thus can be cooled with liquid nitrogen, which is more affordable than liquid helium. The question that has eluded physicists, however—despite three Nobel Prizes to date awarded in the field of superconductivity—is exactly how high-temperatures superconductors work. Materials become superconducting when electrons overcome their natural repulsion and form pairs. This pairing can occur under extremely cold temperatures, allowing the electrons, and the electrical currents they carry, to move unencumbered. In conventional superconductors, electron pairing is caused by natural vibrations in the crystal lattice of the superconducting material, which act like glue to hold the pairs together. But in high-temperature superconductors, this form of "glue" is not strong enough to bind the electron pairs. Researchers think that the pseudogap, and how electrons order themselves in this phase, holds clues about what this glue may constitute for high-temperature superconductors. 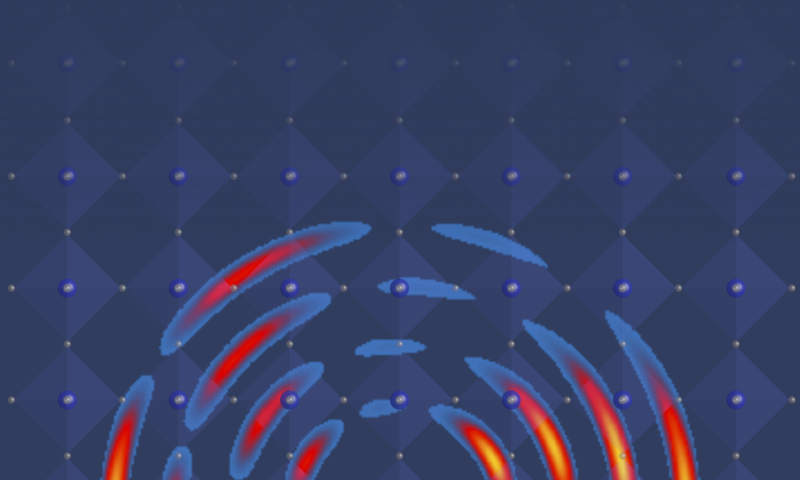 To study electron ordering in the pseudogap, Hsieh and his team have invented a new laser-based method called nonlinear optical rotational anisotropy. In the method, a laser is pointed at the superconducting material; in this case, crystals of yttrium barium copper oxide (YBa2Cu3Oy). An analysis of the light reflected back at half the wavelength compared to that going in reveals any symmetry in the arrangement of the electrons in the crystals. Different phases of matter have distinct symmetries. For example, when water turns into ice, physicists say the symmetry has been "broken." "In water," Hsieh explains, "the H2O molecules are pretty randomly oriented. If you were swimming in an infinite pool of water, your surroundings look the same no matter where you are. In ice, on the other hand, the H2O molecules form a regular periodic network, so if you imagine yourself submerged in an infinite block of ice, your surroundings appear different depending on whether you are sitting on an H or O atom. Therefore, we say that the translational symmetry of space is broken in going from water to ice." With the new tool, Hsieh's team was able to show that the electrons cooled to the pseudogap phase broke a specific set of spatial symmetries called inversion and rotational symmetry. "As soon as the system entered the pseudogap region, either as a function of temperature or the amount of oxygen in the compound, there was a loss of inversion and rotational symmetries, clearly indicating a transition into a new phase of matter," says Liuyan Zhao, a postdoctoral scholar in the Hsieh lab and lead author of the new study. "It is exciting that we are using a new technology to solve an old problem." "The discovery of broken inversion and rotational symmetries in the pseudogap drastically narrows down the set of possibilities for how the electrons are self-organizing in this phase," says Hsieh. "In some ways, this unusual phase may turn out to be the most interesting aspect of these superconducting materials." With one piece of the puzzle solved, the researchers are on to the next. They want to know what role this ordering of electrons in the pseudogap plays in inducing high-temperature superconductivity—and how to make it happen at even higher temperatures. They are...if you cool them down enough. Be easier with an accurate model!